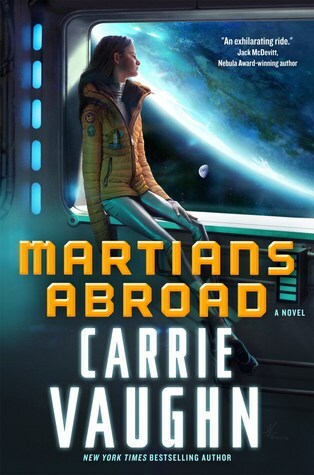 Earlier this week VBC’s Amy told you how much fun Carrie Vaughn’s Martians Abroad is. It’s quirky and we loved the fish-out-of-water idea reversed to have a Martian coming to Earth. We liked it so much we’re sharing the first chapter of the novel right here, and a giveaway of Martians Abroad. Read on for a taste of the book, and your chance to win a copy! The office of Supervisor Martha Newton, director of Colony One operations, was the brain of the entire settlement, overseeing the engineering and environmental workstations, computer banks, monitors, controls, and surveillance that kept everything running. The place bustled, various department heads and their people, all in Mars-brown uniforms, passing along the corridor, ducking into rooms, studying handheld terminals, speaking urgently. It was all critical and productive, which was exactly how Mom liked it. Supervisor Newton herself had a private room in the back of operations. Her office as well as her house, practically—she kept a fold-away cot there, and a stack of self-heating meal packets in one of the cupboards for when she worked late. Some days she didn’t come home. Usually, when she wasn’t sleeping or fixing casseroles, she kept the place clean, spotless, like a laboratory. Nothing cluttered her gray alloy desk except the computer screen tilted toward the chair. Two more chairs sat on the other side of the desk. 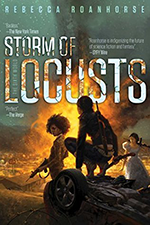 The cot, her jacket, and emergency breather were tucked in a closet with a seamless door; her handheld and other office detritus remained hidden in a drawer. A window in back looked over the central atrium gardens. Anyone entering, seeing her sitting there, expression serene, would think she ran all of Colony One by telepathy. I wouldn’t put it past her. Thanks for being awesome! 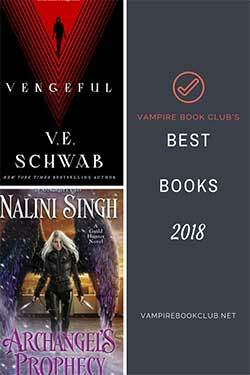 I love hearing about the latest and greatest book giveaways. I’ve really been looking forward to this one, can’t wait to read Martians Abroad. Love Carrie’s books & am really looking forward to this one. Sci fi is not a genre that I read often. I do love Carrie Vaughn as an author, so I’m definitely looking forward to trying!